Caring for Kids Results….Drum roll, please! We just wrapped up our 31st Annual Caring for Kids Campaign benefitting local children’s hospitals, and the numbers are in! We're proud to announce our grand total: $334,122! Many thanks to our longtime partner, the Pittsburgh Lincoln Mercury Dealers Association. Their generous donation of a 2010 Mercury Milan raised over $87,000 from raffle ticket sales! The lucky recipient of this beautiful new vehicle is Mike Gudalis of Sykesville, PA. He purchased his winning ticket at our DuBois restaurant. We’d also like to extend a special thanks to our other partners who helped us reach our goal, including: Sheetz, Vitality Food Service, Geyer Printing, KDKA TV, the Pittsburgh Post Gazette and NewsRadio 1020 KDKA. Our first-ever Black Friday change drive, “Make a Change with Your Change” in partnership with KDKA, raised almost $10,000! Bring in your Smiley Travel Mug for $1.00 refills! If you’re already enjoying your morning brew in one of our Smiley Travel Mugs, we’ve got great news: Now you can fill ‘er up at Eat’n Park for only $1.00, then be on your way! This new refill program not only gives you your daily taste of our delicious coffee at a great value, but it also decreases waste by reducing the number of takeout cups we use. Just bring your Smiley travel mug in to any Eat’n Park location at any time of day to get your $1.00 refill on regular or decaf coffee to-go (Lattes and espresso drinks are not included in this offer). If you don’t already have a Smiley travel mug, you can pick one up at any location, in a variety of designs. Not a coffee drinker yourself? This would make a great gift for the java addict in your life! And, if you don’t live close enough to an Eat’n Park to pick one up for a gift, the mugs are available in our online store. You can ship them directly to your recipient. As our Caring for Kids campaign wraps up this week, the following Eat’n Park locations will be holding Tips for Tots events to raise money for the cause. Servers will be donating all tips collected during the event to local children’s hospitals, so stop by and help make an impact on the lives of kids in your area. 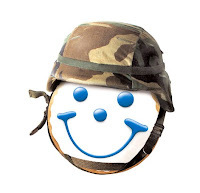 Send a smile to our troops! For those who have grown up enjoying Smiley Cookies at Eat’n Park but no longer live in the area, these treats are an especially welcome holiday gift that brings back fond memories. That’s one reason we began offering our Smiley Cookies for sale online, where they can be shipped anywhere in the U.S.
Well, this year, we’re excited to announce that we can now ship our famous cookies OUTSIDE the U.S., to APO/FPO military addresses around the world! Your loved ones can now enjoy some home-baked Smiley goodness, no matter where they’re stationed. This is a feature that our customers have been asking about for quite some time, and we’re so happy that we’re now able to provide it. APO/FPO orders are routed through the United States Postal Service, and generally take between 7-10 days to arrive. For that reason, we recommend placing APO orders by Thursday, December 10 for delivery in time for Christmas. Click here to place your order today! If you have any questions about placing an APO order, check out our Frequently Asked Questions, email us at responses@eatnpark.com, or give us a call at 1-800-947-4033 x4. First new Smiley Cookie flavor in 20+ years: Gingerbread! What could be better for the holidays than the warm familiar aromas of fresh baked goods? And what could be better than a freshly baked Smiley cookie? Well…..
Our Smiley Cookie has taken many shapes since we introduced it in 1986. Trees, bunnies, stars, dinosaurs, flowers, hearts and fish are all fun, but I was really in the mood for something different. Something with more flavor. Something that really said wintertime and holidays. During a meeting with our menu development team, we discussed popular holiday cookie recipes both from retail and our childhoods. As a child, I remembered my grandma making wonderful pumpkin pies and lots of great cookies, but nothing filled the house quite like the smell of her gingerbread cake (topped with cool whip) and gingerbread cookies! She would cut them in a variety of shapes and let us decorate them with icing and candies, but my favorite was fresh from the oven, still a little warm and soft....mmmmmm! That’s when we had it…Gingerbread! Those were the inspiration for our newest cookie, Gingerbread Smiley. We spent some time working on the recipe to get just the right balance of ginger, cinnamon, cloves, and molasses. Flavorful, but not too much “burn your tongue” ginger. After landing on the perfect recipe, we added our own special Eat’n Park touch….A smile, piped onto each cookie by hand. Obviously, I’m pretty excited about the addition of our Gingerbread Smileys. Now that they are baking fresh in our restaurants, that smell reminds me of Christmas at grandma’s every day! If you’ve had a chance to give them a try already, leave a comment here and let me know what you thought.